Terpinolene is a common terpene primarily isolated from trees. It is present in high amounts in terpintine, which is used in the construction business as well. Terpinolene also goes by the name delta terpinene. Terpinolene is not an analgesic or an anti-inflammatory, yet most cannabinoids and terpenoids are one of the two or both. Terpinolene was concluded to be effective against several species of bacteria. Terpinolene is able to increase total antioxidant capacity levels in white blood cells without changing the total oxidative stress level. Terpinolene is further effective in fighting glial cell cancer and leukemia. Terpinolene was elucidated to be toxic against, Bacillus subtilis, Staphylococcus aureus, Staphylococcus epidermidis and Escherichia coli through the disk susceptibility test minimum inhibitory concentrations measurements in a couple studies. Essential oil composition and antimicrobial activity of Diplotaenia damavandica. Chemical composition and antibacterial activity of essential oil of Heracleum rechingeri Manden from Iran. Antimicrobial activity of the major components of the essential oil of Melaleuca alternifolia. Genotoxic, oxidative and cytotoxic effects of terpinolene were explored with white blood cells. Genotoxicity was evaluated by micronucleus assay, sister chromatid exchanges assay, and 8-oxo-2-deoxyguanosine measurements. Cytotoxicity was detected by lactate dehydrogenase release and MTT assay. All assays were negative. Terpinolene treatment showed statistically significant increases of total antioxidant capacity levels in the cells without changing total oxidative stress levels. This antioxidant effect was also seen in preventing the oxidation of low density lipoprotein, which is helpful in combatting heart disease. The monoterpene terpinolene from the oil of Pinus mugo L. in concert with alpha-tocopherol and beta-carotene effectively prevents oxidation of LDL. Nasal transmission of terpinolene was concluded to induce sleep in mice. Oral administration may prove more potent. A key protein involved in progressing cancers, RAC-alpha serine/threonine-protein kinase, was shown to be reduced in leukemia cells with the treatment of terpinolene. Also brain cancer cells were shown to be significantly affected by the terpene as well, and no signs of genetic damage were seen in the normal cells. Terpinolene demonstrated toxic effects against cockroaches, Blattella germanica,through contact as well as a fumigant. Storage: Room temperature, proper ventilation, spark proof environment. Combustible liquid. Store in a well-ventilated place. Keep cool. Keep away from heat / sparks / open flames / hot surfaces. No smoking. Avoid release to the environment. Wear protective gloves / protective clothing / eye protection / face protection. In case of fire: Use dry sand, dry chemical or alcohol-resistant foam for extinction. Collect spillage. Very toxic to aquatic life with long lasting effects. Dispose of contents / container to an approved waste disposal plant. 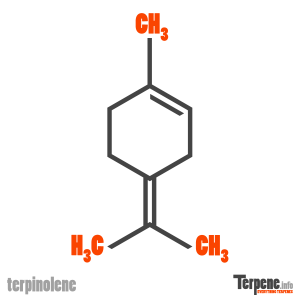 Read through our forum on Terpinolene below, or start your own topic. This forum contains 227 topics, and was last updated by FuanyLx 4 days ago.